Comet C/2013 A1, also known as "Siding Spring," will come within 100,000 miles of Mars this October, but no planetary impact is expected. 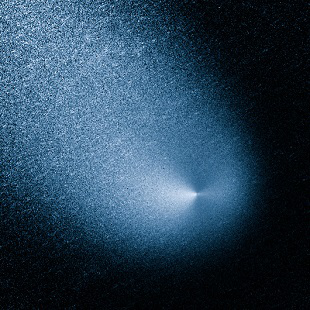 Now that scientists have a firmer grasp on the specifics of comet C/2013 A1, more often called Siding Spring, the astronomy community is confident that the comet will not hit Mars. But it will come pretty darn close. According to new reports, Siding Spring (seen by the Hubble telescope at right) should come within 131,000 km of Mars -- about 82,000 miles -- before slingshotting back around the Sun. In comparison, that's about two-thirds closer than the Moon sits from the Earth (384,000 km/238,600 miles). Of course Siding Spring is exponentially smaller than our Moon. While astronomers originally thought C/2013 A1 was 50 km in diameter, the latest data puts its size somewhere between 500 meters and 2 km -- still big enough to cause serious damage to any planet it hits, but smaller than one of those terrifying city-ships we all know and love. So no comet impact, but what about the tail? Astronomers still believe C/2013 A1's tail could knick the red planet's atmosphere, which could make for some interesting weather, or even cause a "Meteor Hurricane." The tail could send water particles into the atmosphere at a speed of 57 km/sec., which could potentially "increase atmospheric drag on craft orbiting the planet." Possible danger for satellites, yes, but the effects on weather patterns are still unknown.